1. Warm the olive oil in a large saucepan over a medium heat and cook the shallots for 3-4 minutes until starting to soften. 2. Use a vegetable peeler to peel long ribbons from the courgettes. 3. 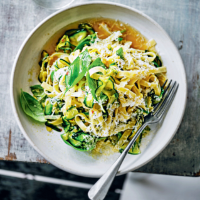 Add the garlic, lemon zest and chilli flakes to the pan and cook for just 1 minute, then add the courgettes and cook for 5 minutes. Increase the heat and add the white wine and chicken stock. Simmer for 2-3 minutes until reduced. 4. Meanwhile, bring a large pan of water to the boil and cook the tagliatelle according to pack instructions. Drain and return to the pan. Add the courgette sauce and toss well together with the basil and half of the cheese, season. Serve in bowls with the remaining cheese sprinkled over.